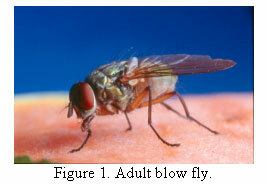 Blow flies (Fig. 1) are non-biting flies found throughout the world. They feed and lay their eggs mostly on decomposing animal remains. Because of this, they often come in contact with human and animal pathogens. So it is important to suppress blow fly populations to reduce the risk of spreading disease. Blow flies are metallic flies about 1/4 inch long. Based on their appearance, they can be separated into two groups, green bottle flies and blue bottle flies. Green bottle flies are metallic green but sometimes have a bronze tint. They are active during warm months of the year. Blue bottle flies are metallic blue to black or purple and are active during cooler months of the year. Both groups of blow flies can be found in urban or rural settings. The blow fly life cycle has four stages of development. A single blow fly can lay up to 2,000 eggs during its life. Eggs are deposited on decomposing animal remains and usually hatch in about 12 hours. The resulting larvae (Fig. 2) feed on the decomposing remains. When the temperature is about 80 degrees F, larval development takes 11 to 20 days. Larvae pass through three larval instars during that time. During the last stage, larvae leave the food source and form pupae (cocoons). Blow fly pupae are football-shaped. Pupation lasts 6 to 12 days. Blow flies can be suppressed with cultural and chemical control methods. Using both methods is most effective and least expensive. Cultural control means changing the environment so that blow flies are no longer able to develop. The best cultural control method is to properly dispose of any decomposing animal remains where blow flies might lay eggs. Dead animals such as birds, cats, dogs and opossums should be buried at least 12 inches deep or placed in garbage bags that are tightly tied. Removing all food residues and cleaning garbage cans weekly will also make the cans less attractive to blow flies. Keep windows screened and doors closed to keep flies from entering a home. Stores and other businesses can place exhaust systems above their doors to reduce fly access, and install doors that open and close mechanically. Sticky traps and ultra-violet light traps placed around homes and businesses will reduce blow fly populations. Chemical control is effective with insecticides that contain pyrethrins. Insecticide sprays labeled for home use can be purchased at grocery and hardware stores. Fly baits, such as QuickBayt® and Golden Malrin®, are not recommended for controlling blow flies. These baits usually are sugar-based and contain a compound that attracts only adult house flies. Always read and follow the directions listed on the insecticide label. The information given herein is for educational purposes only. 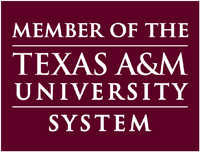 Reference to commercial products or trade names is made with the understanding that no discrimination is intended and no endorsement by the Texas A&M AgriLife Extension Service is implied.